I've been on a bit of a Thai food kick. and now, even as I bring to you this scrumptious salad, a Thai pizza recipe has gotten awfully cozy with next Friday night. I'll confess. I'm not a huge fan of curry. I'm allergic to coconut. I don't even like spicy food. So what is it that draws me to Thai food? If you guessed "peanuts" or "peanut butter" you would have hit the nail on the proverbial head. Let's be honest. That's all I'm really in it for. 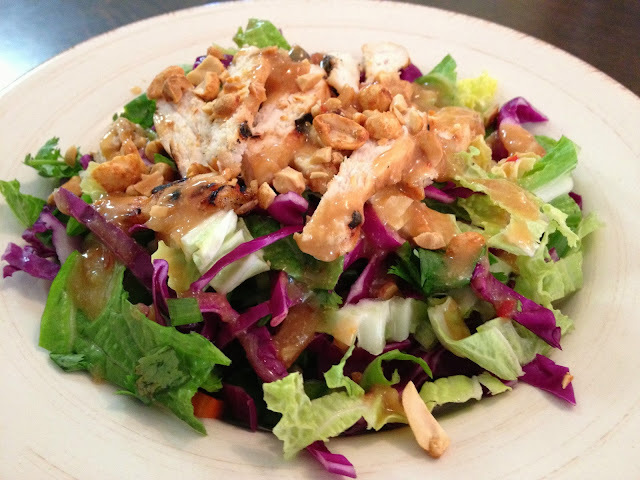 The excuse to spread peanut butter all over salads, pizza, noodles, chicken, whatever. This salad lives up to its name. Crunch. Just about every ingredient in here gives that satisfying feeling. Starting with my new friend. I had never had the privilege of acquaintance with such a cabbage before, in fact, I did not even know such a variety existed until I looked for it at our local supermarket! It is very pretty, chops up nicely, and looks more like iceberg lettuce than its more well known comrade, green cabbage. Next on the crunch list are carrots and cucumbers. I don't need to tell you about them, do I? Then we have edamame. Oh, elusive edamame. I could not find these green soybeans anywhere, so what did I do? I subbed in another crunchy lookalike. Sugar snap peas! They worked like a charm with their fresh taste and signature snap. Oh, and I also substituted chives from my garden for the green onion. Yum. Last on the crunchy lineup are, of course, peanuts. Yay peanuts! And what is poured on top of all the crunchy goodness? This fabulous tangy-sweet dressing. Can you guess what's in here? PEANUT BUTTER. Preheat oven to 375 degrees. Spray baking pan with nonstick spray. Season chicken with salt and pepper, then place in the baking dish. Combine all sauce ingredients in a saucepan, whisking to combine. Bring to a boil, then reduce to a simmer and cook for 3-4 min. until slightly thickened. Remove from heat and pour half of the sauce over the chicken, turning chicken to coat completely. Set remaining sauce aside to dress salad. Bake chicken 25-30 min. or until cooked through. 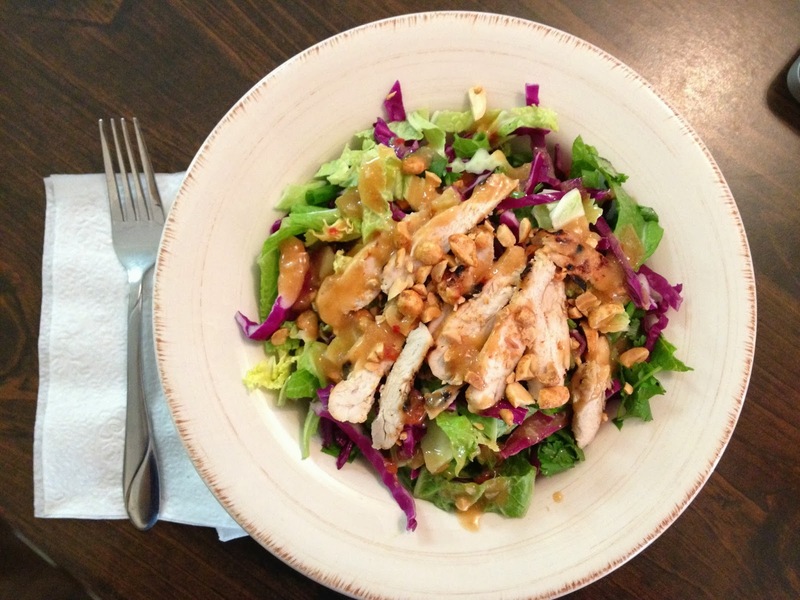 While chicken is cooking, combine all salad ingredients (except for peanuts) in a large bowl and toss. When chicken is done, let cool a few minutes, then shred or chop. Serve salad, top with chicken, peanuts and dressing. Mmm, looks good! I love edamame! I normally find it in the freezer section in the health food aisle. Look there next time! I love peanut buttery goodness food too! 3 Researches SHOW Why Coconut Oil Kills Fat. This means that you actually burn fat by consuming Coconut Fat (including coconut milk, coconut cream and coconut oil).